This burger from Ireland is so unique in preparation; it’s coated in flour and fried and topped with Irish cheese and homemade ketchup. 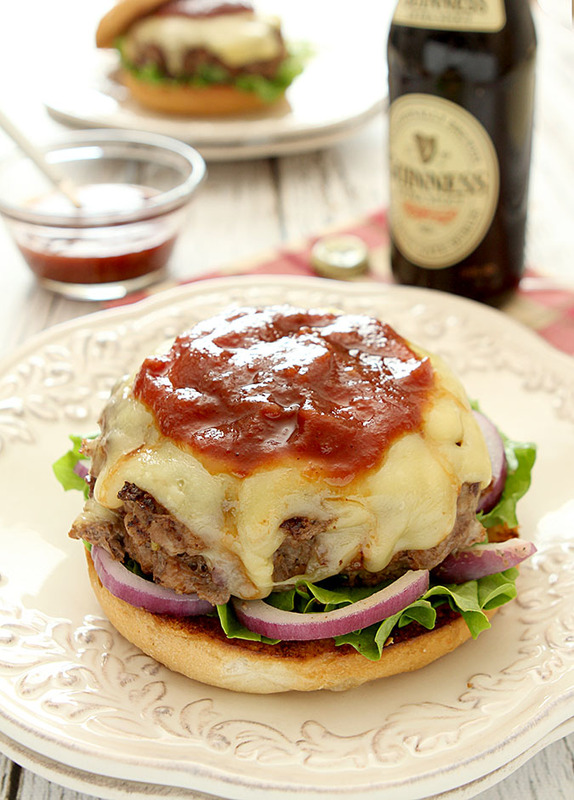 The Dubliner Beef Burger with Homemade Guinness Irish Stout Ketchup is absolutely addictive! Today’s Food Network challenge is burgers; everyone’s favorite way to enjoy ground beef…or at least mine. While I most often grill burgers, this one is unique in that it is not only fried but it’s rolled in some flour before going into the frying pan and the result is a subtle but still crispy crust. This Beef Burger with Homemade Guinness Irish Stout Ketchup has truly become my favorite everyday burger and the one that certainly gets made when it’s either raining, too hot, or even snowing outside and the grill is not on my agenda. I’m not a huge fan of ketchup as I mentioned yesterday in the post for the Homemade Guinness Irish Stout Ketchup I made and it’s been a given for years that it would never grace my burgers; I’m a mustard fan through and through. As a matter of fact, since my youngest daughter graduated from college and moved out I keep a little jar for the occasional addition to a recipe but nothing like the mega containers I had when she was here. She was the type that had to ‘ketchup’ everything; maybe that helped turn me off. That girl could ruin the best omelet or steak in a heartbeat; everything was finished with a big blob of that high fructose red sauce! Once she was gone; so was my nemesis! While I did decide to make my own I have to give credit where it’s due…it would never have happened without experiencing the products from Ballymaloe and I still recommend trying it if you ever see it in a market. Changed my life (or at least my ketchup attitude). Unfortunately it’s hard to find and a bit pricey so I decided this week to try making my own and I think I did a pretty good job; ketchup consumption in my home is surely going to increase with my newfound recipe. When I was first asked to sample these ketchups; I also received a recipe for a burger that include some grilled onions in the mix along with beef, the stout version of ketchup, pepper, thyme and an egg. Some very simple things have made this one of my favorite burgers. First, the onions are sauteed before they are mixed with the beef and seasonings. Of course I presumed this was a flavor thing and I sure do love onions that are sweetened a bit with a short cook time but I discovered something else when I made them a couple of months ago. Not having time to saute, I just added the raw onions into the beef mixture and cooked them on the stovetop as I had done before. BIG mistake. There is a huge value to that pre-cooking step that wouldn’t be evident on the grill…those babies cry a LOT. I mean the pan was basically steaming them instead of frying them by the time they were done. And that is a shame because another step was totally wasted with that happening. I have never seen a recipe for a burger that calls for them to be rolled in flour before cooking but these do and it creates such a nice crust on the outside. As long as the onions don’t sweat and fill the pan with water! Ah…so now I get it and don’t do what I first did. Follow the directions and saute those onions first OK? What a difference that made this week. This really is a burger meant for pan frying too; that outside bit of crunch is a nice balance. This Beef Burger with Homemade Guinness Irish Stout Ketchup is the perfect meal if you want to get our Irish on but don’t have the time or inclination to cook all day. The ketchup is easy; it just takes a while to simmer and well, the burgers take as long as burgers do plus 5 minutes for the onions. Easy Peasy! While there is a huge call from a lot of people to stop consuming products like ketchup that contain high fructose corn syrup just on principle, I just didn’t like the product. 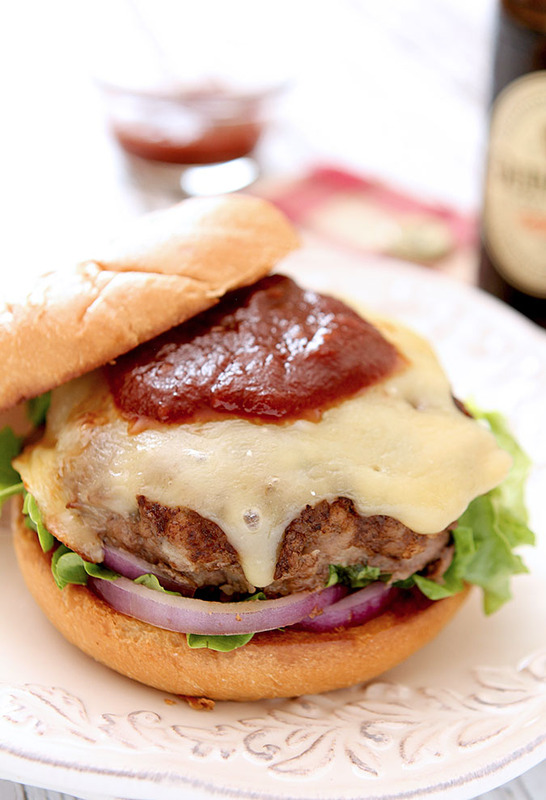 Making my own with fresh ingredients, spices and my favorite beer and adding it to this burger? Priceless! Shape into burgers and toss in seasoned flour, patting off excess. Fry in the olive oil over medium heat, turning as required until fully cooked (internal temperature of at least 160°F) about 4 minutes each side. 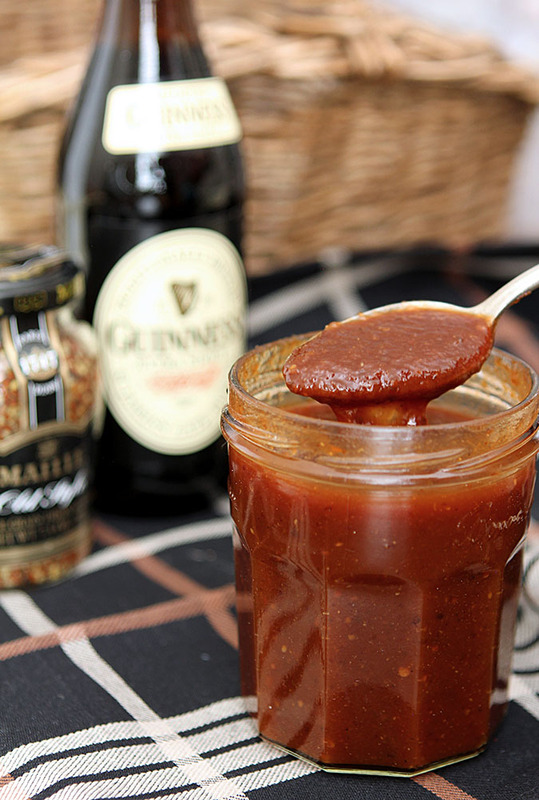 Serve on a toasted bun with cheese shavings, lettuce, onion slice and a dollop of Guinness Irish Ketchup. Awesome! My son said it was the best burger he’s ever had and he doesn’t think he can ever eat a plain burger again! There are those rare comments that make the work that goes into sharing what I love worthwhile. Yours was one of then. And your son is not alone…I feel the same way! Thanks so much for taking the time to comment; it means a lot. VERY much agree with your article and all comments. So impressed with these sauces and ketchups, I contacted Sean Hyde in the USA office and talked them into taking us on as a distributor for Wisconsin/Minnesota. Launching our version of the burger soon…testing has been delicious! Using the products in our pub and selling bottles out of our in-house store: In The Celtic Tradition. Sales are virtually assured as soon as we give folks a free taste. I was totally honest; normally I’m a ‘hold the ketchup’ type but now I would take this slathered all over my burger! That’s probably a more accurate description especially in comparison to our ketchup which is what? Red sugar? 🙂 This was such a simple burger but SO good. Thanks for stopping by! That is one manly, mouthwatering burger! I’ve gotta get my hands on that ketchup, too. We’re in full fledged grilling season here in Austin, so thanks for the inspiration, Barb! I’m so envious Georgia. For years I never paid much attention to our later spring in Denver; after living here for years I just accepted that I couldn’t plant until 5/15. With the advent of social media I am reminded daily that we are indeed a mile high and a mile behind too…I wanted to grill today and I’m usually pretty determined but the combination of wind and cold kept me from that calling! Well, when it comes to ketchup, I could have been your daughter. Love the stuff though I must say that I don’t nearly eat it now, as much as I did way back. Probably because I don’t eat beef anymore. Maybe that was my way of disguising it. I love French fries with ketchup and maybe I love the ketchup more! In any case, now I must try this ketchup and I have always been tempted to make my own! But I’d rather eat it in Ireland. In a castle. Surrounded by sheep and green fields. 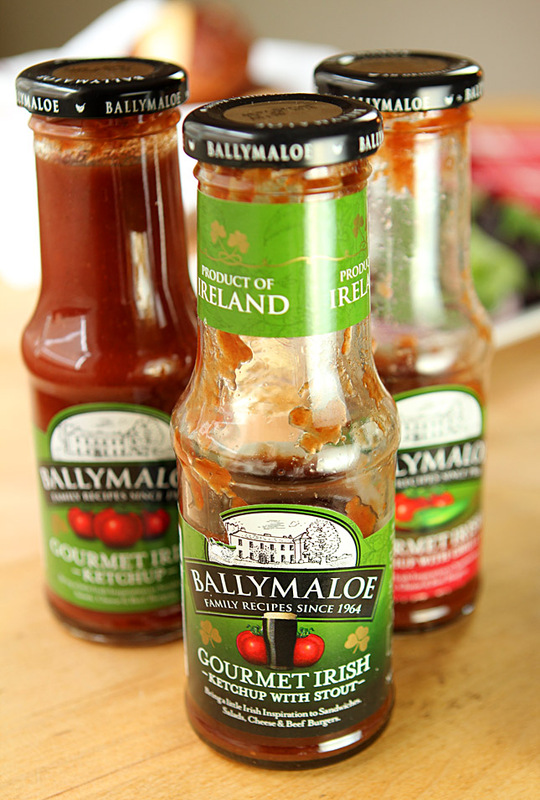 Ballymaloe sauces sound delicious! Peter won’t touch mustard, while I do love it. Your burger sounds quite scrumptious, Barbara. We’re not big ketchup users either. One of these days I’ll probably make my own just because, but we go through about a bottle a year, so buying it seems just as easy. Easier, really. Never had ketchup with stout — like the idea! But it’s mustard on my burger, please. Maybe I’ll dip a fry or two into the ketchup (although if they’re good fries I prefer them with just salt and pepper, or maybe some malt vinegar). Anyway, fun post — thanks.